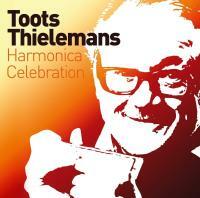 Titre(s) Harmonica celebration / Toots Thielemans, harmonica. Contient Bluesette. - I put all the eggs in one basket. - Don't be that way. - 18th century ballroom. - Soul station. - I let a song go out of my heart. - On the Alamo. - Don't blame me. - Sophisticated lady. - Fundamental frequency. - Stars fell on Alabama. - Struttin' with some barbecue. - Diga diga doo. - Imagination. - So rare. - Isn't it romantic. - Skylark. - Sonny boy. - Homesick, that's all. - Cocktails for two. - East of the sun. - Scotch on the rocks. - Penthouse serenade. - The nearness of you. - A pretty girl like a melody. - In a sentimental mood. - This is always. - You took advantage of me. - Stranger in paradise. - Cool and easy. - Stairway to the stars. - Love walked in. - The cuckoo in the clock. - Long ago and far away. - I love you, Porgy. - Early autumn. - You stepped out of a dream. - Theme there eyes. - You're driving me crazy. - A handful of stars. Notes Jean-Baptiste Frédéric Isidor, Baron Thielemans, connu sous le nom "Toots" Thielemans (1922-2016) était un musicien belge de jazz (harmonica, guitare, sifflets). Comme aucun autre, il a aidé à faire de l'harmonica un instrument respecté dans monde du jazz d'aujourd'hui. Ce double CD est consacré aux premières oeuvres de cet artiste exceptionnel. (Note du distributeur). - https://www.gamannecy.com/upload/htmls/0090204690404.html.